What you MUST know about where today’s online marketing is headed. It’s all about Reputation and Reviews. What’s the difference between Reputation Management and Reputation Marketing? Reputation management has become outdated. This strategy typically deals with monitoring how often a company’s name or its products and services are mentioned on various directories, review sites, and social media platforms. It is the equivalent of damage control because actions are usually taken to respond to what has already been said. This is a very defensive position. On the other hand, Reputation Marketing is a very offensive position. Once a 5-star reputation has been established, that reputation can be marketed online. That 5-star company is seen as the market leader in their industry and the clear choice of being the most reputable company that potential customers should do business with. You don’t make money by managing; you only make money by marketing. Why is Reputation Marketing the most important type of marketing I can do for my agency? There are many answers to this question but here are the 2 most important considerations. Now that consumer reviews and the company’s reputation score are being displayed within organic search results, business listings, pay-per-click, and just about every other place, potential customers can easily decide who they want to do business with based on the experience of others. Secondly, comprehensive studies conducted by reputable firms such as Nielsen Media and Bright Local have shown that roughly 70% of consumers trust online reviews as much as personal recommendations. Therefore, it should be easy to see that building a 5-star reputation online, and then marketing that reputation, is the most powerful and most trusted type of marketing that any business can do. Customers are looking to do business with the most reputable, trusted company they can find. Now that reviews and ratings are clearly displayed online, that becomes a much easier decision for them to make. Why are marketing strategies such as SEO, pay-per-click, social media, local marketing, and email campaigns no longer effective? Your company’s reputation is now very transparent. 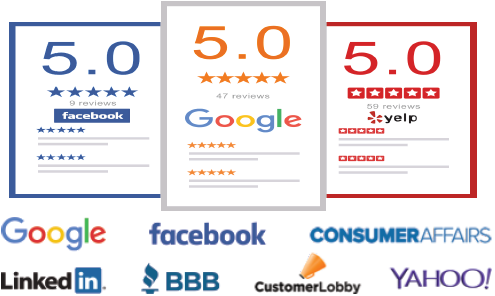 Customer reviews and reputation scores are now being displayed right along with the regular search engine results, listings on business directories such as Yelp and City Search, and even pay-per-click ads. It makes no sense to spend money on expensive PPC campaigns, newspaper ads or search engine optimization when customers will only check out your reviews first before deciding if they want to do business with you. If you don’t have at least 6 to 10 reviews with a 5-star rating, your phone is not going ring. More importantly it could be the difference of your phone not ringing and your competitor’s phone ringing instead. How does Reputation Marketing work in conjunction with my other marketing strategies? In the course of developing a 5-star reputation for our clients, we utilize a variety of proven strategies such as SMS, email templates/campaigns, custom-designed postcards, business referral cards, video testimonials, and many others. These tools can be used along with many other online marketing strategies your company may be currently using such as social media, blog posting, online and off-line promotions, and many more. We work with our clients to develop a Reputation Marketing Culture within their organization. We provide the tools and training so that all of their staff members are focused on providing the best possible customer experience, which leads to receiving 5-star reviews that build and maintain a 5-star reputation. I have plenty of testimonials, why do I need Reputation Marketing? That’s great if you have lots of good testimonials. It sounds like you are focused on providing a first-class customer experience; however, that is only a small piece of the overall picture. First of all, those testimonials need to appear not only on your own website but many other places as well to be most effective. Your office staff cannot post those testimonials and reviews online themselves because all of the review sites have created special algorithms and filters that delete all reviews that are posted from the same computer IP network. Additionally, the reviews themselves need to be created with a specific strategy in mind so that they will convert your prospects into paying customers (instead of boring them with someone’s life story and personal rant). We work with our clients and train them how to get those strategically-written reviews that really convert. We also post those reviews online using our proprietary strategies and systems so that they will remain on the various review sites for all of your prospects to see. I already have a great reputation. Isn’t that good enough and why do I need you? I commend you if you already have a great reputation. You obviously understand the value of honesty and first-class customer service. However, that alone is not enough because you are only one customer away from a bad reputation online. You or any one of your staff could have a bad day; it happens to all of us. That could easily give that first-time customer a bad experience. Their bad review could spread to several different sites, which makes you appear to have a bad reputation. Because most of these review sites display the most recent reviews first, your current customers and potential customers will usually see that bad review before any of your good ones. I have no reviews online, why is that bad? Having no reviews is almost as bad as having bad reviews. It all comes down to this. People look at reviews as a gauge for the type of experience they can expect to have when dealing with your company. If you have no reviews, a potential customer has no idea what to expect and will generally not take a chance on having a bad experience. I’m sure you have experienced this many times yourself. I purchase a lot of products from Amazon and I often see some with no reviews and the invitation to “Be the first to review this product”. I always look for that product or something similar offered by another vendor where people have already given good reviews, just so I don’t have any bad experiences. What tools or strategies are most effective for getting customer reviews? First of all, you have to provide a great customer experience and first-class service which immediately makes getting 5-star reviews that much easier. We have found that the simpler you make it for customers to post reviews, the more likely you are to get a review, especially if you have older clients or those who are not computer savvy. We have developed many tools and strategies to help our clients get those 5-star reviews but I would say 3 of the most effective ways would be to utilize our custom-designed postcards, specially formatted business referral cards, and custom e-mail templates, which inspire people to not only read but also take action. This is part of our Reputation Marketing Culture strategy, which is part of our overall Reputation Marketing program. My staff doesn’t know about Reputation Marketing, will you provide training for them? Don’t worry, most companies have no clue when it comes time to Reputation Marketing and that’s why we are here to help. They generally are not aware of the latest trends and strategies nor do they have the time to train and monitor the progress of their staff on that topic. As part of our Reputation Marketing Culture program, we set up an education training center for each of your staff members to log into so that they can learn about and fully understand what Reputation Marketing is. We provide individualized training and testing and send the results to a designated person within your office so you know which of your staff understands the concepts or needs additional training. What basic capability can my agency get from your (Integrity Reputation Marketing) services? Differentiate your agency from your numerous competitors (internal and external). Stand out as the obvious choice. How reviews can help insurance agencies? 88% of customers use online reviews to make purchase decisions. Most insurance agencies have 2 reviews or fewer — more reviews can give you the competitive edge you need. With Integrity, automatically collect new reviews on sites like Google and Facebook to turn your clients into your marketing engine. Online reviews are the new word of mouth, reaching more consumers than you could ever hope to reach in the physical world. How I can build clients’ trust with new reviews? Easily gather new reviews from your clients via automated SMS and MMS alerts sent to their mobile devices. Integrity sends clients straight to top sites like Google and Facebook, and establishing credibility to prospects. How it is important to dominate regional competition on Google search? Local listings are the third most influential factor in search engine rankings. Keep up-to-date and consistent business information (name, address and phone) across 50+ consumer sites and business directories that matter most to your business so you’re found easily in online searches. Display all your reviews and updated business information on your personalized business microsite from Integrity — optimized for search engines and indexed by Google. When prospects search for insurance companies in your area, they’ll find an overview of your great reputation right on page 1 of results. Local listings are the third most influential factor in search engine rankings. Keep up-to-date and consistent business information (name, address and phone) across 50+ consumer sites and business directories that matter most to your business so you’re found easily in online searches. Display all your reviews and updated business information on your personalized business micro-site from Integrity — optimized for search engines and indexed by Google. When prospects search for insurance companies in your area, they’ll find an overview of your great reputation right on page 1 of results. What an insurance agency must keep in mind before policy renewal? Monitor your online reviews from all the top sites like Google,Facebook, Yahoo and Consumer Affairs — all from one clean dashboard. Make sure policy and fee updates don’t damage customer loyalty. Receive real-time alerts whenever you get a negative review, and respond immediately to fix issues before they escalate. What is boosting online visibility? 92% of online searchers read reviews. 84% value the recommendation of a third-party referral the same as a friend or family member. The Reveo platform helps you magnify your online reputation by auto promoting your reviews to your website, Facebook, Twitter and other social sites that matter most to your business. As you collect reviews, they are indexed by search engines, helping improve your search ranking with newly submitted content. What are additional measure the agency must take to build the online reputation? Automatically display your star rating in search results, giving customers the confidence to choose your business. Automatically showcase the best customer reviews on your website from the most important thirdparty social sites. What do you (Integrity Reputation Marketing) do to help grow my business/agency? Easily collect new positive reviews for your business with Reveo’s real-time feedback review invitations. Engaging with your customers at the moment they make a purchase makes it easy for them to write a review. Automatically Collect, Monitor, & Manage Your Online Reviews through One Single Dashboard. Easily generate online review from your customers at the most important social sites, from one integrated dashboard. Respond to and manage customer feedback in real-time, on the most important social sites, from one integrated dashboard. See all customer reviews from one integrated dashboard & analyze trends to make informed business decisions. I would like to schedule a 15-minute conversation. Thank you.